The Brittany, which is often known as the Brittany Pointer, the Epagneul Breton, the Brittany Wiegref, and the American Brittany, was named after a French province where the breed originated. 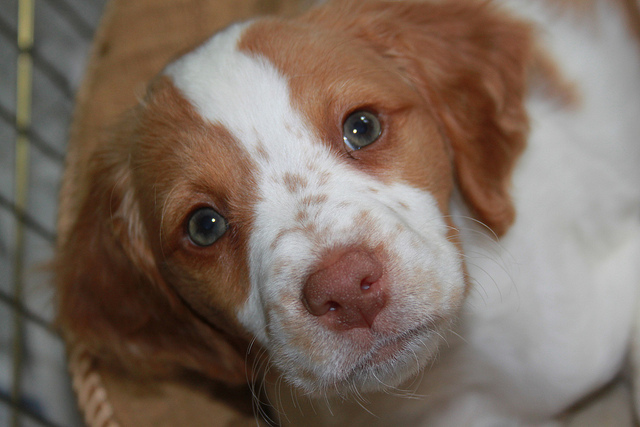 While the breed was originally registered as the Brittany Spaniel by the AKC, it actually should be a part of the pointing breeds because of its method of hunting, and today it’s been added to the Sporting Group by the AKC. These dogs have plenty of energy, they’re sensitive, and they’re very intelligent. Since they are loyal and compact, they make excellent pets for families of any size as well. Here’s a closer look at this breed, its history, and other essential information to consider if you’re considering adding a Brittany to your family. While the precise facts regarding the beginning of the Brittany breed have been lost, these dogs do descent from France. The breed traces back to at least 1850 when a clergyman in England wrote about hunting with bobtailed, small dogs with rough coats that worked well when hunting in thick brush. It’s thought that the native Brittanys may have had some influx of pointing-dog and English setter blood, which increased their natural hunting and pointing abilities. These dogs were great working dogs for the French peasants, since they were great guard dogs and pets as well as hunting dogs. This breed was finally recognized in 1907 when “Boy,” a white and orange dog, was registered within France under the name “L’epagneul Breton queue courte naturelle,” a name that was later shortened to just “L’epagneul Breton.” In that year, the standard for the breed was outlined, requiring that the dogs have a short tail when born and noting that white and black dogs should be disqualified from registration. However, later the requirement of a natural bobtail was dropped. It wasn’t until 1931 that Brittanys came to the United States and in 1934, the American Kennel Club recognized the breed. 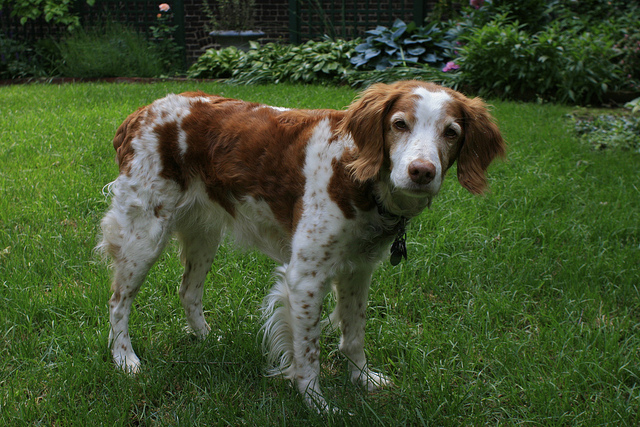 Later, in 1942, the American Brittany Club would be founded, and the club decided upon a written standard for the breed that was more accurate. 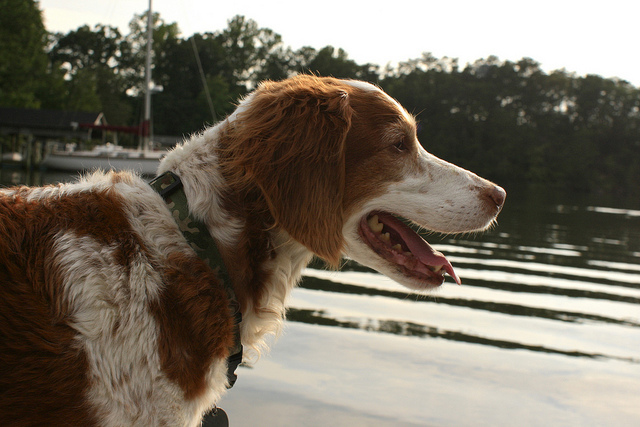 In 1982, the breed was recognized by the AKC as just the Brittany. Brittanys are medium in size with a short, single coat and very long legs. These trim dogs don’t appear overly muscular and they have short tails that may be docked. Their ears have a triangular shape and set high atop their head. The eyes are either amber or hazel, depending upon the dog’s coloring. While this breed shouldn’t have black noses, they can have brown, pink, fawn, or tan noses. 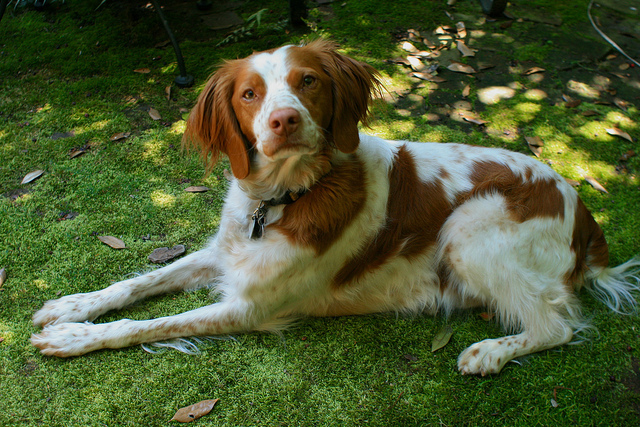 The Brittany boasts a dense, flat coat that may be wavy, although it shouldn’t be curly. They have slight feathering on the legs and ears, although the feathering shouldn’t be long. Their loose skin helps to keep them protected from burrs and thorns when the dogs are working in dense brush. Most commonly, this breed comes with a liver and white or an orange and white coat. In some cases, they may come in roan patterns, which is a fine mix of colored and white hair. Less often, these dogs may come in tri-color, which is white and liver with orange marks on the muzzle, cheeks, tail, brow, legs, and tail. Usually, Brittanys stand between 17.5 inches and 20.5 inches at the shoulder. Dogs taller or shorter than this are disqualified within the show ring, although they can still make wonderful pets. These dogs usually weigh 30-40 pounds, although the females are usually a bit smaller than the males. 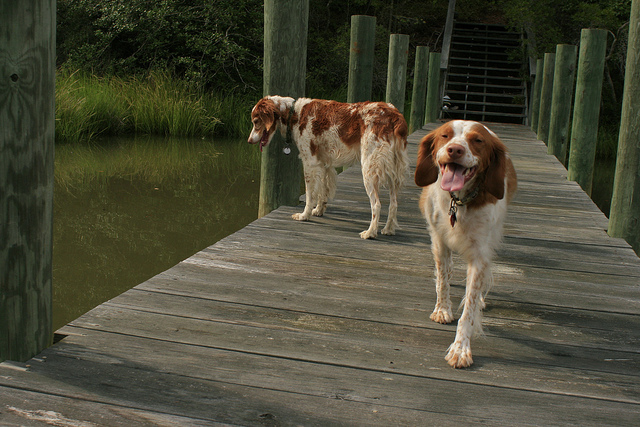 The Brittany should be proportionate in size, with the height of the shoulder being about the same as the dog’s length. 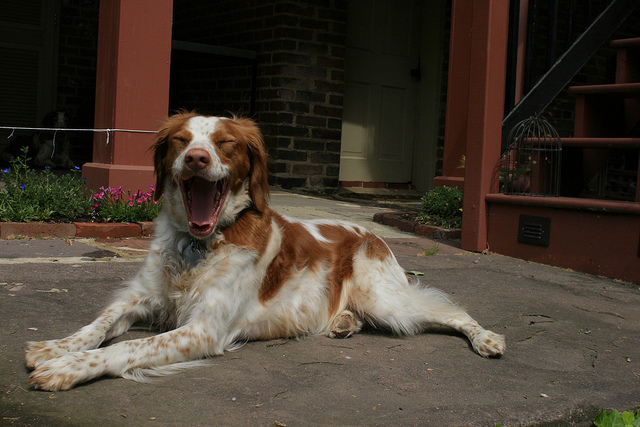 The Brittany has a zest for life and is an energetic, happy breed that enjoys being outdoors as much as possible. These dogs are great family pets that enjoy going on outdoor trips and hunting excursions just as much as they love playing with the family kids outside. The breed is loyal and even-tempered, and they consider their family as their pack. You can always count on these dogs to be affectionate and happy. While these medium-sized dogs may seem like they would be great pets for an apartment or condo, they actually need a place where they have plenty of room to get outdoors and run. Brittanys require plenty of exercise daily, and just a stroll around the neighborhood won’t be enough. Since these dogs are so great at hunting, these dogs will appreciate being with a family that goes hunting. The breed is very intelligent, so Brittanys do well with obedience training. The best way to teach these dogs is with positive reinforcement, since harsh behavior may result in avoidance behaviors or upsets to the breed’s sensitive nature. Beyond the basic commands, these dogs don’t need any training out in the hunting field, since the hunting behavior is bred into the dog. It’s essential to socialize these dogs early and frequently. While they are great hunters, they can be shy, so it’s important to expose them to new situations and people early to avoid problems with timidity. Many owners appreciate that Brittanys are very low-maintenance. They only shed lightly through the year and with regular brushing, the shedding is barely noticed. Unless these dogs get dirty, they only need a bath every few months, and dry shampoo can prolong the time between baths. It’s important to check the ears of a Brittany every week for infection, redness, and irritation, particularly if the dog spends a lot of time outdoors or goes hunting. Using a veterinarian approved cleanser for the ears can help with the prevention of ear infections. 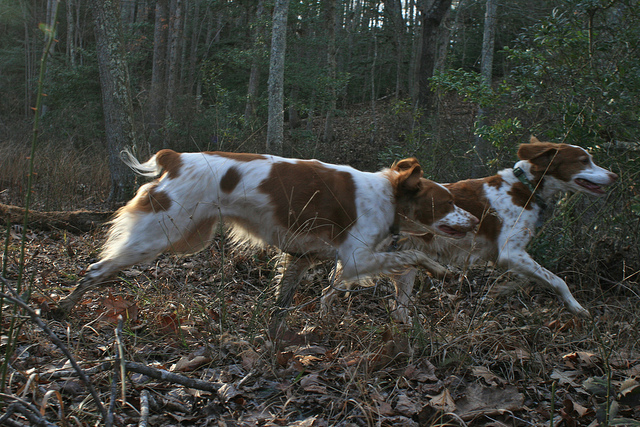 Originally, the Brittany was designed to be a hunting dog. These dogs not only pointed, they were great retrievers. They are often used for hunting still today. Brittanys also perform well in hunting tests, conformation rings, and in AKC field trials. However, in most cases, these dogs are kept as loving, loyal pets.